First off sorry for the delay in posting – summer is a pretty busy time around here. A little bit of rain brought me a needed break so I’ll nug this one out real quick. In this entry we’re going to begin looking at wire. Wire from an obstacle standpoint is used to either contain (keep in), exclude (keep out), channel (direct into or out of an area or along a path), and delay. There’s that word delay again – and it goes back to a basic tenet of obstacles: A determined threat isn’t going to be stopped by an obstacle instead it will only be delayed as the threat deals with that obstacle. Given that tenet along with the fact we’re not too worried about keeping stuff in the rest of the wire series is going to deal with delaying and channeling. Is wire really a feasible obstacle? Hell yes. I watched a Bradley run into some triple strand concertina once and become completely stalled once it wrapped around the suspension. I’ve seen guys have to be medevaced because they got tangled up in some concertina wire and it tore them up so bad they looked like they had made a few trips through the blender. I’m primarily going to use this entry to define the types of wire I’ll be discussing in some of the following entries. It’s important to know the different types of wire simply because some types are better than others at given tasks. So later on when I say “you can use X wire” we’ll be on the same sheet of music. The first type of wire we’ll use is good old barbwire. It’s pretty straightforward and everyone knows what that is so I’m not going to go in-depth on it. The next wire we’ll look at is what I call “goat fencing” but it’s also called hog wire, sheep wire, etc. There’s a lot of varieties and sizes of this type of wire but for our purpose (and since I’m cheap) I use the cheapest thing I can find which is usually a 4 foot tall 300 foot long roll of what the Co-Op sells (see the pic below). Why use this type of wire? If you embed it in the ground one cell deep and anchored nobody is going to crawl through it without some cutting. I’ll go more in depth on how to use goat fence as the wire entries progress. Next up is razor wire and tape. This kind of wire is designed for one purpose – inflicting pain through sharp cuts and it does that all too well. Normally you’ll find this kind of wire in rolls (the tape comes like a roll of tape) but it also come in rolls wrapped around another piece of wire to give it some additional rigidity like the piece in the center of the illustration below. Military concertina wire is made of reinforced razor tape wire. On a serious note: from what I understand it may be illegal to use razor wire in some states or counties. Check your local laws and make sure you’re not doing breaking them if you put razor wire up pre-SHTF. Razor tape isn’t as common as it used to be for one reason – it is pretty much unmanageable once deployed. Good for long term single use once deployed but moving and reusing it is more work and pain than I’d ever care to deal with. 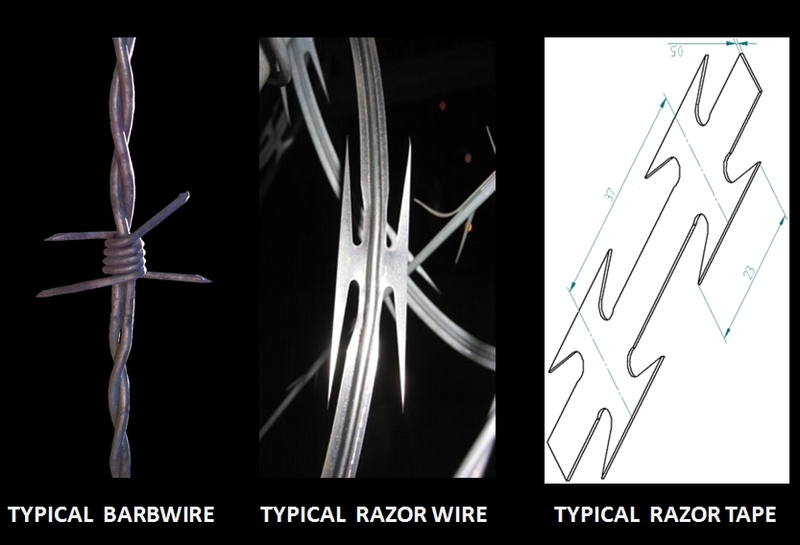 Razor wire also has varying types of barbs – the “NATO” type which the military uses has much less aggressive barbs than other types. Don’t let it fool you – it’s still pretty painful to get wrapped up in. But what about electric fences? Good idea. Every gotten popped by one? It’s a deterrent. And although it may not be feasible to rely on grid power to run one even a solar powered charger can give a decent enough zap to slow someone down (and make them yell) if they’re trying to get through your fence or obstacle. Hell even an unpowered line that looks hot encountered after a live one is enough to slow a threat down and make them pause as they approach it. During this series as I address electric fence lines you’ll see me call them “zap lines”, “hot wires”, etc. Those are the most basic types of wire we’ll be using in the blog. yeah there are others and truth be told I won’t even begin to try and imagine all of the different types of wire available. For the series we’re using the ones I illustrated above. Now there is one more thing in this entry I want to address and it’s a configuration of wire. Remember above I referred to military concertina wire. It’s good to know that “concertina” is the design and not the wire type itself. Concertina means that the wire is assembled to be deployed from rolls along the end of the roll instead of the side kind of like a Slinky. 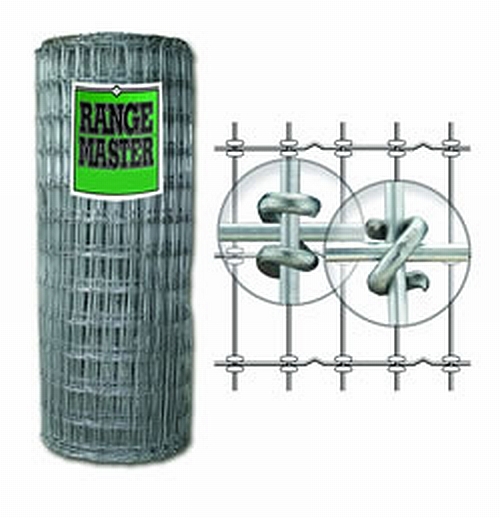 It’s designed to be somewhat portable and fairly faster to emplace than a regular wire fence. Concertina wire is made from several different types of wire including barbwire and razor wire. Although most military concertina is made from reinforced razor wire nowadays originally it was handmade in the field out of barbwire by troops. Military concertina can be found at surplus auctions sold as scrap and in some states can be bought at Co-Ops. So let’s say we haven’t found any concertina or it’s unavailable in our area. What can we do? Make our own. You’ll need some tools for this one. First up is a good heavy set of gloves. If you’re dealing with barbwire then a good heavy set of leather gloves will suffice. If you’re dealing with razor wire or tape then you’ll want something a little better. The military version are some seriously heavy leather gloves with metal staples embedded in the palms and fingers. Next up you’ll need a good set of wire or fence pliers (aka hognose pliers) – you’re going to be bending and crimping a lot so the bigger the better. Of course you’ll need some kind of wire but you also need another roll to cut , crimp, and hold the rolls together (I’ll refer to this as tying wire). 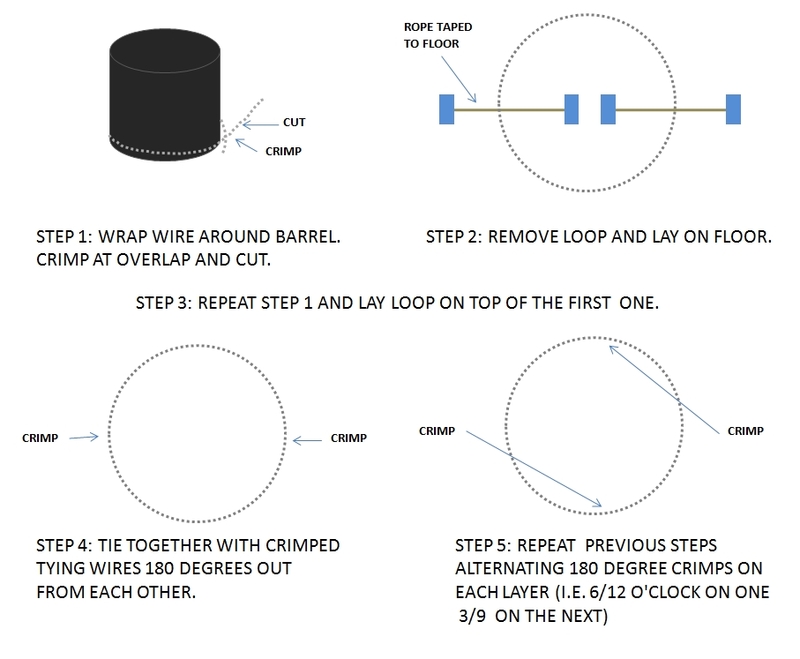 You’ll also want some kind of rope to hold the rolls together once you have them assembled. One final tool you will need is a drum, tub, or other uniformly round object to serve as sort of a template. That’ll give you some uniformity and help make the task a lot easier. Ideally you want something big enough to give you at least a 36″ diameter loop. In this example I’m going to use barbwire because it’s common and can be had for cheap (see the I’m a cheap bastage entry for some ways to get it almost free). Anyway the first step is to run a loop of wire loosely around our drum. Then where it overlaps itself you’ll take another piece of wire and crimp it together and then cut behind it a few inches and bend that back over itself. You don’t have to necessarily cut it (you can crimp and make it out of one continuous roll as you go) You should now have a barbwire loop. Slide it up over the drum and set it aside. Continue doing that until you run out of wire or think you have enough. At that point you’ll take a loop and lay it on another loop and using your tying wire and hognose pliers join those two loops together with two crimped pieces of tying wire 180 degrees from each other. Next place another loop on top of the first two and join it to the first two by crimp two tying wires 180 degrees out from the first two. Continue doing this making sure you alternate the crimping points between each set. If the wire starts to become unmanageable you can tie them together as you assemble them with something as cheap as monofilament fishing line to help keep them in place. It also helps to compress the roll you’re creating as you go along to make it more manageable – a 2×4 across the coil with some knee pressure should work. Once you’ve finished you’ll end up with a coil that looks like a giant barbwire slinky. You’ll also want to run a couple of pieces of rope through the entire assembly to hold it together until you get it to where you want to deploy it. Laying and taping down these ropes and the monofilament lines out ahead of assembly makes the task much easier. It’s not easy nor efficient but it is an alternative if you can’t get your hands on the real deal. 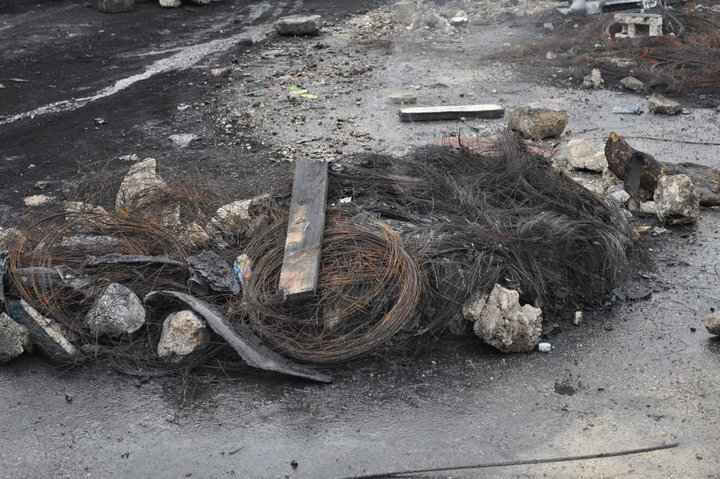 One expedient source for a tangled mess of wires that nobody seems to think about is the remains of tires once they’ve been burnt – especially steel belted radials. Although you probably don’t want to bother with trying to sort it out a half dozen burnt out tires in and long a trail can create one helluva mess for anyone that happens to get caught up in them. Take a look at the pic below and imagine walking into and getting hung up in it in the middle of the night – not a pleasant prospect at all. Add some broken bottles to it along with a few spiked boards and caltrops and this thing is flat out nasty if you have to deal with it. So we’ve covered the most common types of wire we’ll be using along with a basic how-to make your own concertina. In the next entry we’ll be looking at employing some of these obstacles and how to get creative employing them. In the meantime if you’re looking for a source for military wire The DRMO auction site is a good place to start – it takes some searching but you should be able to find an auction near your area. It’s hit or miss but from my experience surplus/scrap wire comes up more often than not. This entry was posted in Defensive Measures, Hardening the Homestead, Security Planning, Terrain and AO Development. Bookmark the permalink. 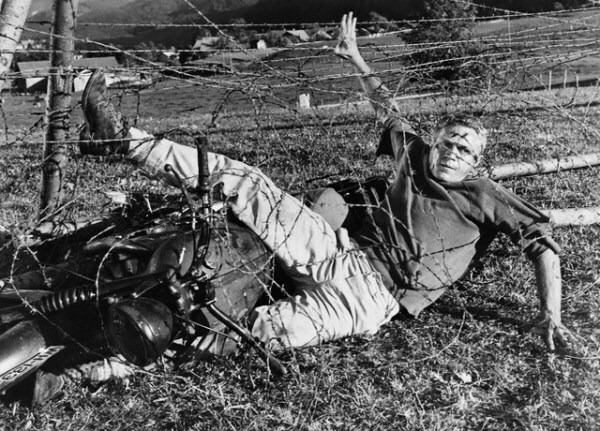 Isn’t that 1st pic Steve McQueen tangled up, with his bike, in that wire? Yup – a true classic.